The PiKoder/PPM will continuously output neutral PPM16 pulse frames (8 channels with 1.5ms pulses each, 20ms total frame length). The channel pulse length would be controlled by simple ASCII-character based commands send over the UART (parameters are 9600 8N1) thus allowing to control the PiKoder through a standard terminal program. For customizing your PiKoder for your application the most relevant parameters can be adjusted and stored in the PiKoder's non-volatile memory. 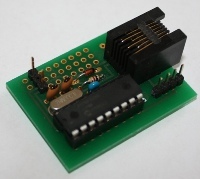 The PiKoder/PPM provides thus the bases for controlling PPM encoding for RC, robots, and drones through a serial UART. This encoder works with a broad range of supply voltages ( 3.3 to 5 Volts) allowing you to use a microcontroller's power supply in most instances. This kit allows you to efficiently evaluate the PiKoder/COM. All in- and outputs are easy to adapt via connectors. Firmware upgrades 'in-place' are supported through an ICSP port. The PiKoder/COM User's Guide describes the programming of the PiKoder/COM in detail. This script demonstrates how to set the channel values using the Ascii Command Interface.